marital bless: I absolutely love paying down/off debt! In the past, money has been tight for us for reasons outside of our control. Recently though, money has been tight for us, because we have agreed to agressively pay down/off our debt. I only say this, because we honestly have people in our lives who are like, what do you mean you don't have money? You both have jobs! It's so hard to explain to people that while yes, going out and blowing $300-500 a weekend by shopping/eating/entertaining ourselves may be fun . . . it's just not worth it to us. Personally, I think that Americans need to talk about their money more. I grew up in a house that money was not exactly a taboo subject . . . but I never understood how magically my Mom was able to produce money when a need arose. I think so many people could be helped, if only they had a friend that could swallow their pride and tell them, "Put down the trivolty and credit card." I managed to survive college without any credit card debt, I actually didn't even have one! I knew myself better than to open an account lol. When Tony and I married however . . . I inherited his debt. 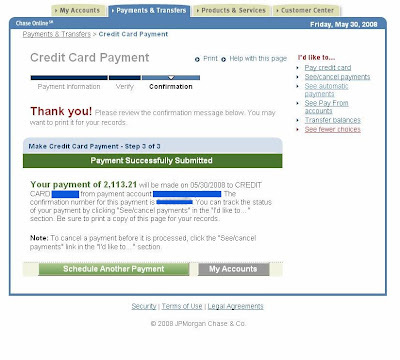 At this time I am so thrilled to report that one of our personal loans is paid off, in addition to the credit card!!!! Next up the Honeymoon personal loan, which we are only 1 1/2 months away from accomplishing. After that Tony's student loans! Great job!! I absolutely love the "$0 Balance" line!! Wahooo! Nice work. I love paying it off too :) Keep on keeping on. Sooner or later it'll be gone! YAY! That's awesome! Nice job!